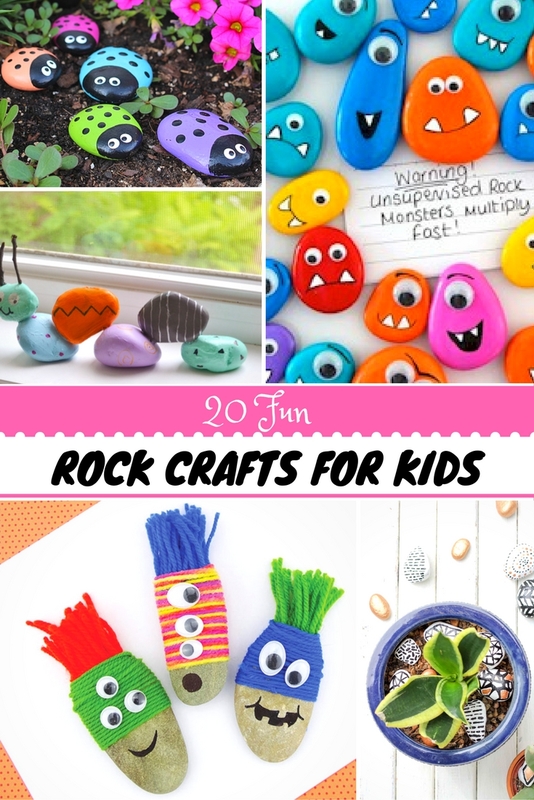 20 Fun Rock Crafts For Kids Roundup! Sometimes coming up with an extravagant craft is more work than the kids can appreciate. These crafts are great for almost any age. A baby can use their hands and a toddler can get more creative. You can choose one of these guides or you can simply just paint rocks. No Pressure! Maybe you can spend some time outside collecting rocks on a nature hike before coming home to use them for this. Possibilities are endless with rock crafts! Here are 20 that we have rounded up for you to check out. Maybeit will spark your own rock craft idea. Let us know how it went over in the comments! Very cute craft with Monster faces. Use this to inspire you to make different faces such as angry, sad, excited etc. You can use them to help children communicate their feelings using their very own painted rocks, when they aren’t feeling great at expression. This one is a great decoration for the garden. Or maybe a ‘pet turtle’? We can make pet rocks a thing again! Another great garden decoration or maybe a gift you can have your child make for anyone who is an avid gardener in the family? Or maybe you just think lady bugs are cute and want some hanging around your window sills. Almost like a puzzle, kids can get creative with how they set up their snake each time. Fun! Super similar to the snake craft but caterpillar form. This craft is similar to the first monster craft link except it’s done with just sharpies and googly eyes. Great for camping or when the power is out. Have kids customize their own pieces and then go crazy at the game! Easy and fun. Just yarn and rocks! This is a ‘welcome’ rock for your porch. Whoo’s there? Add an interesting flair to your potted plants. Ok, this might be one for mommy too. Do your kids love cats? This is a step by step guide on how to get the perfect kitty on a rock. Fun for babysitting, you can make your little rocks into people. Paint whole families! Color matching is involved in this puzzle. Great rock crafts for the holiday family times. If your little is like mine and LOVES anything that lives on a farm this is perfect for them! Also great for a general spring craft. A good reason to get outside collecting rocks and a pretty addition to any spring decoration box. Fun holiday inspired craft! Also good for any age. Bees are important! What a great way to open up conversation around what they do for us. This is a very open craft. Doodle whatever inspires you! Rocks and googly eyes. That is all. Rock your alphabet, what more can I say? These rock monsters involve yarn and googly eyes as well. That’s it! I hope these links bring you some inspiration and a fun day of collecting, washing and crafting with rocks. Heh! This is perfect for my 7-year old. She loves to collect interesting rocks and we have them ALL OVER THE HOUSE. We’ll have fun with these crafts. Shared and pinned!